Actually I could start with the review of The World Is Flat (And Other Alternative Facts) right on. Most progressive rock lovers are probably familiar with the Dutch band Silhouette. Their previous album Beyond the Seventh Wave (see review) which was released in 2014, can be tagged as phenomenal classic progressive rock album. Many reviewers put that album in the higher regions of their personal “best of” lists. The band got even the iO Pages Prog Award for this album. Unintentionally this lays some pressure on the band to continue this extremely high level. Expectations were therefore high. 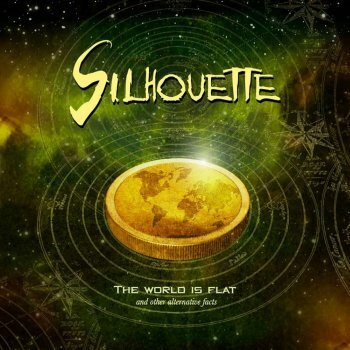 Silhouette delivers with The World Is Flat its 5th studio album in about 10 years. It's very interesting to see and to hear the musical progression from this band. On the first albums you here clearly the influences of Marillion and a little Genesis. In general the music was very melodic and had a firm quality standard. But when Daniel van der Weijde joined the band, the band made a major progression. Daniel is a very talented guitar player and he gave the band some sort of heavy boost. Due to this adjustment, Brian de Graeve, got the opportunity to focus more on vocals. From this point you can say that Silhouette has two excellent vocalists. Because next to Brian they've got also Erik Laan on vocals. Erik is a fabulous keyboard player, blessed with a very nice voice. These vocals give a unique sound colour to Silhouette. It distinguishes Silhouette from bands with the normal line up. Especially when Brian and Erik are singing parts together it's goosebumps for me. Silhouette has the following line up: Brian de Graeve (lead & backing vocals, 12-string guitar), Daniel van der Weijde (electric and acoustic guitars), Erik Laan (keyboards, bass pedals, lead and backing vocals), Jurjen Bergsma (bass, acoustic guitar, backing vocals) and Rob van Nieuwenhuijzen (drums, percussion). On this album a violin is a real violin. There are not much samples used and I like that. The additional musicians are: Joke Laan Morsch (soprano vocals), Marjolein de Graeve (backing vocals), Chantal van den Dungen (flute), Petruschka Schaafsma (oboe), Ger Otten (French horn) and Sophie Zaaijer (violin). The album opens with the track March Of Peace. As always the band has an open view towards the world. It's obvious that our world is always in some sort of state of war. Silhouette calls for peace in a very original way. They use phrases from different well known songs to make their point. The song is up tempo and has a rather heavy character. Daniel's guitar play has some interface with Dream Theater. March Of Peace is the best album starter you can imagine. The album continues with The Flow. It is one of the nicest tracks on the album, in my opinion. The 9 minute song has a lingering atmosphere. The additional instruments push the song to the top. Keyboards and rhythm section are fabulous and reminds me of IQ. The guitar parts are from heaven. It looks like John Petrucci is playing them. What a great song. As already said, Erik Laan is a phenomenal keyboard player. On Six Feet Underground he proves this right from the start. Classical piano and different synthesizer layers take the lead in this song. In Six Feet Underground modest- and heavy dark parts are interfering with each other. The song is completed with great vocals, exciting guitars and classical instruments. Further on the song is rather complex regarding to song structures. Once more it reminds me a little bit of IQ. Symphony For A Perfect Moment is the most epic part of this album. This song lasts for almost 18 minutes. It starts rather melodic. The keyboard parts are mostly in the spirit of Dream Theater. The same for the guitar parts. Daniel is really one of the best progressive rock guitarist in our country. He understands where he has to be melodic and were he has the opportunity to use the “darker” scales. Symphony For A Perfect Moment is an absolute adventure through different musical landscapes. A journey without getting bored. Absolutely fabulous song, which displays the capability of this great band. It's hard to describe this song. Just listen to it for yourself. Sakura is a 3 minute intermezzo with Spanish guitar in an exciting scale. It all sounds classical but it has also some tension in it. This song is a great bridge between two songs. The album ends with Turn It Off. The song opens with just the additional classical instruments. Afterwards guitar and strings come up. I sense a touch of Steve Hackett in this beautiful song. The song is modest in a way. Just at the end heavy guitar atmospheres fill in some parts in this song. The World Is Flat is one of the best albums Silhouette has ever made. The album is never boring, alternately, journeying through the landscapes of music. It's nice to see that this band has developed itself into one of the best progressive rock bands in The Netherlands. I am, as a lover of progressive rock, proud of this epic album. I think this is also the heaviest album the band has ever made. The influences of Dream Theater for example lift this album up to a heavier region in progressive rock. I highly recommend this album to everybody who loves the genre from Genesis up to Dream Theater. Therefore just one conclusion: the maximum of 5 points! Excellent album.